As if you haven't listened to or read enough opinion on this year's Oscars...or yammered on and on about it yourself...here's even more. Let me tell why the Oscar's failed...musically speaking. First off - congrats are, again, in order for A.R. RAHMAN for winning BEST ORIGINAL SCORE for SLUMDOG MILLIONAIRE...and also for BEST SONG, "JAI HO" also from the film. "The Dog" was anything but that tonight taking a home a handful of the "Golden Boys" in addition to the two musical categories. Rahman winning didn't come as much of a surprise. All the signs were there for SLUMDOG to do well were there and that included Rahman's score. While I'd like to have seen Alexandre Desplat win for THE CURIOUS CASE OF BENJAMIN BUTTON, I knew it was a loooooooong shot against the tidal wave that is Slumdog Millionaire. Now, "Jai Ho" was an easy pick and was far and away the most memorable song of the year...despite all the love "The Boss" was getting for "The Wrestler" earlier in the award season. Taking a look at the show as a whole...and it's revised format...it had some great moments, but wasn't what I had expected. First, the good. By far having the 5 former winners of the acting categories come out, pay tribute to the nominees, and then have them all on stage with the winner was a stroke of genius. It really makes those particular awards special. It was clearly written on the faces of the nominees. By the way, seating them so close to the stage was also smart (and intimate). Next, Hugh Jackman was the right man for that particular job. The opening number was entertaining enough and got me to thinking this just might work. Finally, it was good to see MICHAEL GIACCHINO on stage and did a decent job for the night. Ok...now for the bad. After the opening number, things went down hill (aside from the best actor/actress categories). What started as a decent-enough award/winning theme, became a serious pain 3.5 hours later...no matter how many variations they played. Talk about listener fatigue. As a video game composer, GIACCHINO had to know that this theme was going to get old fast....and boy did it ever. That's just too many awards to play the same theme over. What upset me was the fact that by replacing the original themes from the associated movies, one of the most important moments for film music exposure was totally lost. Instead of walking up (albeit a very short walk...or jog/run) to the podium with the related music of the project, we got this winner-theme again and again. I was ecstatic when costume designer, Michael O'Connor, made direct reference to RACHEL PORTMAN's score for THE DUCHESS and how that was NOT the music he had just walked up to the mic with. The general public, who hardly ever pays attention to film scores, was robbed of one of the few chances that film music would be publically highlighted. The best score medley was average - hitting all the right beats, but the best song medley became a disaster. Now, I love John Legend, but he was not the right replacement for PETER GABRIEL. How about Phil Collins or Steve Winwood...or someone somewhat related? I understand why Gabriel pulled out and the producers of the show had to do something, but "Jai Ho" and "Down to the Ground" just don't mix very well. I also somberly look forward to the "In Memoriam" segment...usually underscored with an approriately beautiful piece from Mark McKenzie or other talented composer. This time, we got a vocal performance by Queen Latifa. It was the least emotional of all the In Memoriams that I can recall. And why no Heath Ledger? 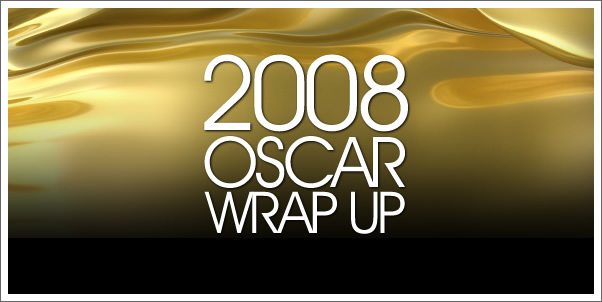 Now, I am all for change and experimentation and I think there were a few things to like about this year's Oscars; however, I definitely prefer the set up and style of the past. Somehow this felt more like THE TONY's than THE OSCARS. In their quest to shorten the show, things felt rushed... and much of the emotional impact felt in previous shows was absent. Of course, skimping or radically changing the use of original score will do that. So here's to next year. May they return to some of the traditions of the past...at least when it comes to the music. I think heath technically died before last year's oscars, but they should've put him in this one. The dark knight was not even nominated for score??? that's rediculous. i'm so sick of the academy's prejudice against action movies. when will smith came up after the action segment, he only gave one award to an action movie. an benjamin buttcrack did not have better fx than iron man! it's a shame, will said that he loves action movie and they get over looked, and then slumdog wraps up everything in their action=y segment. I completely agree with your statement that John Legend was perhaps not the best replacement for Peter Gabriel. I was also rather disappointed with the "Musical" segment that was performed. Beyonce? Really? Joel Grey was at the awards and I am sure Fosse rolled over in his grave hearing Beyonce butcher a selection from Chicago. Also, why didn't they show case Amanda Seyfried's voice during the "Mama Mia" portion of the performance? After all, Seyfriend was cast in the movie, unlike Beyonce. I believe this is the last Academy Awards I will be watching for many years to come. I am ashamed to say that the awards are no longer for the best, but for the most popular.